BBC NEWS | Technology | A robot in every home? A prototype next-generation "leisure robot" went on show at the Consumer Electronics Show in Las Vegas last week. Robosapien V2 is the successor to what was one of the top-selling toys last Christmas. The taller, smarter humanoid bot will have two new companions which it will detect and play with - Roboraptor and Robotpet. The prototype, with a vocabulary of more than 1,000 words, won a prestigious prize for innovation at CES. The robot, out in September, is entertainment, but is "serious robotics", said its makers. "This is a real robot," Art Janis from WowWee, Robosapien's creators told the BBC news website. 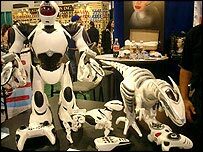 Other "real" robots on the market were either high-end entertainment bots, like Sony's Aibo, or task-driven ones like the iRoomba vacuums, he said. "Our competition costs thousands, but we want the common person to have a robot," added Mr Janis. The robot picked up a Digital World Innovations Award, which recognise 15 top products which mix technology and consumer electronics. By 2007, it is projected that there will be almost 2.5 million "entertainment and leisure" robots in homes, compared to about 137,000 currently, according to a recent United Nations robotics report. By the end of 2007, 4.1 million robots will be doing jobs in homes, says the report by the UN Economic Commission for Europe and the International Federation of Robotics. Ten inches taller than its predecessor, V2 can dance, lie down and do Kung-Fu. It is also a lot more agile and is fully autonomous in roam mode. With cameras in its eyes and its hands, Robosapien V2 can recognise red, blue, green and yellow colours as well as skin tones. This means it can distinguish between a human and an inanimate object. 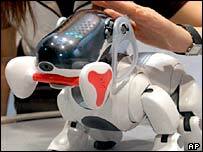 If it spots Roboraptor - a robotic dinosaur - or Robotpet, it will start to control and play with them on its own. "If you left a beer on the floor, with the camera in its hand, it would bend down and pick it up," said Mr Janis. With its eye cameras, the robot can recognise a human in front of it. If that human moves, Robosapien eyeballs the human and politely inquires where they are going. Robosapien V2 is also laser guided via a games controller-like remote. The robot will follow the path traced by the beam, and will interact with objects in its path.